And their claim of recent acceleration is wildly false. Many gauges show no sea level rise, or sea level falling. Few, if any show acceleration (upwards curvature) in recent decades. National Geographic is defrauding their readers with their flagrant lies. Tide gauges that do show sea level rise, generally show that sea level rose faster in the past. East coast tide gauges show that sea level rose much faster prior to 1950. Look at the broken cue stick, National Geographic’s contribution to climate change sporting goods. 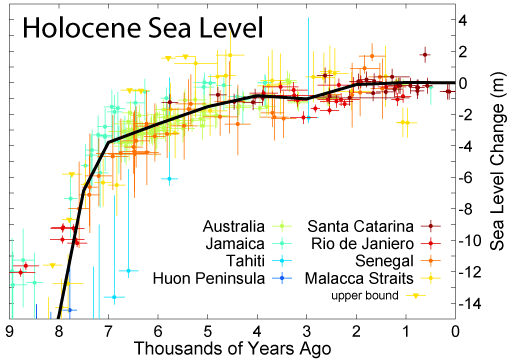 Note in the chart of the Holocene sea level rise the red cross on the top right (Santa Catarina) moves the line through the points from a decreasing sea level trend to an increasing sea level trend. Again Santa Catarina is that dark red cross above the pack on the right. Remove it and sea level is actually falling for the last 2,000 years. Construction of Holocene wave-built terrace – The sea-level drop following the 5.1 ky BP culmination stage originated the wave-built terrace abutted against the original barrier island, with the consequent shoreline progradation in general as regressive beach ridges. Several truncations of these beach-ridge systems, as well as many levels of marginal lagoonal terraces suggest that the dominantly regressive trend was momentarily interrupted by minor transgressive episodes. The radiocarbon ages of the natural shell beds indicate that between 5 and 3 ky BP the relative sea-level was higher than today, with consequent expansion of the lagoonal areas frequently transformed into bays, and warmer paleotemperatures were favourable for great proliferation of mollusks in the area (Mendes 1993; Pitoni 1993). “…a relative sea-level change curve for the last 7 ky in the area Florianópolis-Jaguaruna (Fig. 7) is outlined…” Note the curve at the very top of the post. Two more studies showing falling sea level. …..Widespread evidence exists for a Holocene sea level higher than at present in the southern Arabian Gulf, indicating that it peaked at 1–2 m above present level, c. 5.5 ka bp……. All three studies from around the globe show FALLING sea levels! WHERE does that ‘adjusted’ graph show that fall of 1 to 2 meters? Instead if you look closely the graph shows a ~1.5 meter RISE instead of a fall since 5000 years ago! That is an ‘Adjustment’ of 3 or more meters to data from tectonically stable areas. Lysenkoism at it’s finest. What I love about climate is that day after day after day, the evidence keeps mounting against them. So, sooner or later even idiots like Obama will realise that these fraudsters are just that. And thankfully, because of sites like this, they will not be able to claim “but no one said anything different” … which is what they’ve always said in the past when they controlled what could and could not be printed. As noted in an earlier post here, approximately 66% of the GHCN record is estimated after processing by the GHCN adjustment models. In the current GHCN data set, there are 226 unique country codes represented. Following are the top and bottom stewards of temperature data, by country, based on the frequency that the GHCN adjustment models replace their raw data with an estimated value. Tells us that the acceleration of sea level rise has been negative since 1992. That presentation by Dr. Steve Nerem (He keeps the satellite data at Colorado U’ Sea Level Research Group) is a few years old now but it remains true. and do the acceleration calculation for themselves. Sydney, Australia. 6 cm per century … not that any of the local government nor local media want to share the truth. I started looking into the ‘adjustments’ due to post-glacial rebound and tectonic uplift (mountain building) and got side tracked into the censorship performed by NOAA/NASA. We describe how the existing sea-level equation incorrectly predicts the change in sea level (and thus the ocean load) in ice-covered, subgeoidal geographic regions during periods of deglaciation. We go on to present a new sea-level equation that overcomes this problem and we describe how this equation can be solved in a gravitationally self- consistent manner by employing a well-known spectral technique. Application of the new theory to predict relative sea-level (rsl) histories and present-day, 3-D, solid surface deformation rates in northeastern Canada (based on a single earth model characterized by a lithospheric thickness of 100 km and upper and lower mantle viscosities of 5×1020 and 5×1021 Pa s, respectively) demonstrates that a significant error is introduced when the original theory is employed to predict the oceanic component of the surface load. Predictions of rsl curves show a discrepancy of ∼40 per cent at sites where data have been obtained and employed to constrain models of earth viscosity structure and ice- sheet histories. This error will significantly bias estimates of mantle viscosity structure and ice thicknesses that are based on the original theory. In addition, predictions of 3-D deformation rates differ by up to 25 per cent in some regions and so future applications that employ these data to constrain models of the glacial isostatic adjustment process should adopt the improved sea-level theory. In contrast, estimates of inverse decay times from the predicted rsl curves are insensitive (to within the observational error) to the improvement in the surface load introduced by the new theory. Thus, viscosity structure inferences based on this parametrization and the original sea-level equation are unaffected by the error in the ocean load. Finally,the new theory predicts a eustatic (i.e. globally uniform) rise in sea level over the postglacial period that is ∼11 m lower than that determined via the original theory. Therefore, estimates of the global ice budget at the last glacial maximum based on far-field rsl data and the original sea-level theory will be too small by ∼10 per cent. And finally the fly in the ointment for these models is the new finding of thin hot crust under the oceans off Africa and off South America. Was walking along the beachfront and this obvious greenie was looking at the rock shelf that had been exposed by the heavy swells over the last week.. He said something about “climate change” causing it..
That Nat Geo graph says basically – anything can happen in the next 85 years. What’s the point of that? Is it meant to show that years of accumulated ignorance have been unable to reveal to us how sea level will progress in the future?